08:30am: We left the comfort of the Fox Tor Bunkhouse in Princetown, and headed off in the mist to North Hessary Tor. Six of us, with only myself with any comprehension of what was to come, having walked most of it before. For those not in the know about the Perambulation of Dartmoor, it is a route that twelve knights took to define the boundary of Dartmoor Forest back in 1240. This boundary has 32 distinct points that you must visit if you are to emulate their challenge. Some are obvious, some, are not so obvious. Our perambulation attempt was expected to take us three days, traversing 45 miles of the highest and more remote parts of the moor, crossing rivers, marshland and peat bogs. The route is littered with ancient monuments; stone rows, stone circles, bronze age settlements and other prehistoric features. It really is a "must do" for any Dartmoor walker who is fit and able. The first hill came quickly, straight out of Princetown, and it was beginning to dawn on them what was ahead. The TV mast on the top of the hill, was shrouded in a cloud, but our Boundary Mark #1: North Hessary Tor (ALIAM YSFOTHER) was visible. By now, the mist was clearing, and we even caught a glimpse of the sun and the odd rainbow brightening up the Walkham valley as we wandered down to cross the river. The River Walkham was a surprisingly slippery customer to cross, we all took differing routes across in the space of 100 metres, I finally decided to take the plunge and paddle across! Up onto Boundary Mark#3: White Barrow (WHITABURROW). My companions didn't give the small grassy mound that sits along the Lich Way a second glance; I’m not sure they even noticed it! Boundary Mark #4: Limsboro Cairn (LUNTESBOROWE), sits on Lynch Tor, and is much more impressive than the previous waypoint, and we stopped for a break among the granite outcrops. It was then a long slog through long grass over The Meads before hand-railing Eastern Red Lake, to Sandy Ford. From there we made our way alongside the Tavy to Boundary Mark #5: Rattlebrook Foot (RAKERNESBROKYSFOTE). We met a guy on the way who mentioned that on the longest day, some people do the whole perambulation in one day; rather than be impressed, we just asked “Why?” It's far too good a walk to spoil rushing through! The crossing of the Rattlebrook saw our first casualty. The same man suggested this was the best place to cross, and, on cue, Catherine fell in up to her waist! Same man made a hasty exit to catch up with his party! We climbed up to Hare Tor, for lunch and a good place to dry her clothes in the breeze. Passing Chat Tor, we made our way back down to the Rattlebrook, following it up passed Bleak House and the peat works. Once again, obvious bemusement when I stopped in the middle of nowhere and confirmed we were at Boundary Mark #6; Rattlebrook Head (RAKERNESBROKESHEDE). It wasn't far to reach Boundary Mark #7; Steng-a-Tor (LA WESTSOLLE), and the mood of the party took a dip when my friends saw the climb down into the West Okement Valley. Jude was particularly good at finding knee deep holes amongst the clitter, I just kept telling her to be really careful but it didn't seem to do the trick. Paul admitted later, he was ready to beat me to death with my walking poles! It was an adventure dropping straight off Steng-a-tor, but in any future attempt to do this walk again, I'll likely contour east to a path that descends from Kitty Tor to Sandy Ford. We crossed Sandy Ford and began picking our way, through the granite, up to Fordsland Ledge, exhausted. Simon broke out the mint cake, and even though we were very grateful, it would have been more help if he’d done so at the bottom of the hill! Rested, we were soon up and over the highest point in Southern England, High Willhays, at 621m, and on the rocky track to Boundary Mark #8; Yes Tor (ERNESTORRE). After Yes Tor was ticked off, it felt like the home straight into Belstone, but in truth, we still had some way to go. We left Yes Tor at just gone 6:30pm, and our pace would dictate that we still had another hour and three quarters to go. 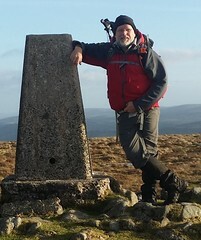 We plodded on, via Boundary Mark #9; Cullever Steps (CORNER-VER STEPS), stopping by a boundary stone for Okehampton Parish, where the steps meet the East Okement. Cullever Steps was our last perambulation point of the day. The boundary heads up over Belstone Common, then straight down to Taw Marsh before climbing again to Cosdon Beacon, but we were done for the day and our Bed and Breakfast at the Tors Pub in Belstone beckoned. We arrived at 8:15pm, a very long day of nearly 12 hours! Exhausting, but highly rewarding!